On Saturday, I went to Alameda for a walking tour of Alameda's Gold Coast neighborhood. Yes, it's true—I do occasionally leave Oakland. To be sure, there were lots of Oakland connections like Julia Morgan and the transcontinental railroad, but I am interested in other places besides Oakland. And it was a nice chance for me to just go on a walk instead of leading or helping out on one, as I usually do with Oakland Urban Paths. Although I chose a Julia Morgan-designed house for the photo above, the neighborhood is best known for its Victorians. Oakland has plenty of lovely Victorians, like the cluster in Preservation Park, but Alameda's Gold Coast is a must-visit for fans of the style. There are numerous beautiful, well-maintained examples in area, and a variety of other architectural styles, too. The walk was part of the Alameda Walks program, this one led by Robert Perricone. You may remember the name, as he's been on numerous Oakland Urban Paths walks, and I've used some of his photos upon occasion. Many Americans are still catching on to it, but soccer (or futbol or football to the rest of the world) is a fun sport, and watching it during the World Cup is hella fun. It's like March Madness (for you basketball fans) or the NFL playoffs (for you American football fans), but further energized by being a truly international competition (sorry, 'World' Series) and being held only every 4 years. Oakland being the multi-cultural place that it is, it's unsurprising that the World Cup is a really big deal here. With the growth of Oakland Wiki, it was unsurprising that someone asked Where to Watch the World Cup?, and that it took little time for the new entry to be filled out. A lot of people in the Bay Area these days don't have TVs, or if they do, don't have cable to access channels like ESPN where many of the World Cup matches are being shown. (pro tip: Univision is showing all the games in Spanish. It's available over the air on channel 66-2.) And even if you have a TV and cable, there's something different about watching an event like the World Cup with a group of other fans. Sunday I checked out a couple of locations. Era Art Bar was packed with people to watch the U.S. play Portugal. I was there to meet up with Baba Afolabi and check out the offerings of SuRu Clothing who is sponsoring World Cup viewing events at Era and other Oakland locations, along with The Umoja Festival. "Suru" means patience in the Yoruba language, and "to do" in Japanese, and interesting cross-cultural coincidence. Suru has some great, well-made gear (I bought a stylish green track jacket), so check it out next time you're watching the World Cup around Oakland. And you'll be shopping local! I then cycled around the lake to Rooz Cafe to meet up with Sonny Le. While Rooz was crowded, it was no where near as packed as Era. Rooz has a new projection system installed specially for the World Cup, so it's going to be my go-to place for games I don't watch on Univision en Español. Adiverse group of 150-200 volunteers and city employees came together on Friday to build a new playground at Burckhalter Park on Edwards Avenue. Morgan Stanley brokerage not only put up a lot of money to make this happen, but sent out about 45 volunteers to help build it. I heard about the project through councilmember Desley Brooks' office, but while I was there I ran into people I know via other Oakland connections including College Avenue Presbyterian, the Oakland Fire Department, and Oakland Urban Paths. It was great weather for the build (though maybe a bit too warm for those working in full sun), and it was a festive event, with a DJ playing music, lunch for the participants, and a lively camaraderie between different groups working on different parts of the project. While the playground structure was getting a lot of the attention, volunteers were also putting in new plantings, cleaning up the park, constructing picnic tables and benches, and even creating a casual outdoor classroom area. I talked with Clinton Pugh, who is the park supervisor (and grew up nearby), and he was excited not just about the work being done on Friday, but the longer-term potential of getting the community more involved in taking care of parks in East Oakland. I also talked with Alameda County Community Food Bank executive director Susan Bateson, who told me about some of the other work that Morgan Stanley is helping fund, a mobile food pantry to help cover the needs of school children through the summer months. According to the story on ABC 7 News, it's all part of a larger "Healthy Cities" initiative that Morgan Stanley is sponsoring. They're also partnering with La Clinica de la Raza to provide health screenings for children. I was too busy with work to stay long, but I really wish I could have been there all day. A big thank you to everyone who helped make this happen, including KaBOOM! who brought their playground expertise (and a lot of workers, too, I think). And an extra special thank you to the volunteers (hi, Nancy!) who did tons of prep work in the days and weeks leading up to the event. If you're the curious sort like me and wondering about the name "Burckhalter", I don't yet know why the park name is usually spelled 'Burkhalter' but the tennis courts, nearby elementary school and Burckhalter Avenue are spelled 'Burckhalter'. But the school (and doubtless the other sites) are named for astronomer Charles Burckhalter. He was a teacher at the original Oakland High School, and the director of the Chabot Observatory for 38 years, overseeing its initial growth and move to Mountain Blvd. in Leona Heights. He also invented an apparatus to help take better pictures of solar eclipses, and plumbed the depths of Lake Tahoe (with a champagne bottle) to determine its 1,645 foot depth, a measurement later confirmed by the U.S. Coast and Geodetic Survey. Saturday about 40 people and half a dozen dogs joined Oakland Urban Paths for walk starting at the former 16th Street Train Station. Two common threads through the walk were "parks, places and people", and earthquakes, railroads and freeways. Many forces have shaped Oakland over the years, but the latter are three of the big ones. It didn't take long into our walk to see evidence of all them. For many years, Oakland was the terminus of the first transcontinental railroad, and that opened up the way to more immigration from the rest of the U.S., and opened new markets for California products to be shipped elsewhere. The 16th Street station replaced the earlier train station on 7th Street in 1912. But the 16th Street station was badly damaged in the 1989 Loma Prieta Earthquake, and Amtrak service moved to Jack London Sqaure and Emeryville in 1994. The 1906 earthquake brought more than 100,000 refugees from San Francisco, many who stayed in Oakland even after San Francisco rebuilt. After crossing Mandela Parkway, where the Cypress Structure stood until the 1989 earthquake, we stopped at de Fremery House to hear from architects Philip Banta and Norman Hooks. They've envisioned a West Oakland Walk (W.O.W.) as as a network of "Parks, Places and People". It’s an urban design concept to leverage central city assets into a "green social circuit" for walking, biking, organic gardening, exercising and meeting friends, activities that build sustainable communities. We followed about 3.5 miles of their 4.5 mile loop. A short walk took us past numerous beautiful homes, including the historic Hume-Willcutt House, where Joseph Willcutt, director and secretary of the Southern Pacific Railroad lived. Keeping with the earthquake part of the thread, the house lost an ornate brick chimney in the 1989 earthquake. Then it was to the I-980 freeway. It divides West Oakland from downtown, even though they are a short distance from each other. Historically there was much more interaction between the two because they're adjacent, but now a large, physical and psychological barrier limits the interaction to a few noisy overpasses. Looping through Frank Ogawa Plaza downtown, we saw what appeared to be a small press conference. I ran into some of the participants later, and it turns out they were shooting a small scene from an independent movie about the Occupy movement. After stops at the African American Museum and Library of Oakland and the First Unitarian Church (badly damaged in both the 1906 and 1989 earthquakes), we crossed back over the freeway. On our way along 14th Street, we stopped at the Cypress Freeway Memorial Park, which remembers the victims of and first responders to the freeway collapse during the Loma Prieta quake. After the remains of the double-decker freeway were removed, the neighborhood fought to have the new freeway routed elsewhere. Now the parkway is a lovely open space, and the adjacent neighborhoods were rejoined. A great walk. Thanks to everyone and everywoof who came out for it, and special thanks to Phil Banta and Norman Hooks for sharing information about the West Oakland Walk, and some of Oakland's parks, places and people. Next month's walk will be Saturday, July 12, in the Golden Gate district in north Oakland. To learn more about some of the parks, places and people we talked about, see this list of pages on the Oakland Wiki. If you enjoyed the walk and want to learn more, or if you missed the walk, the Oakland Heritage Alliance will be covering some of the same route in August. They won't be doing the full 4.5 mile loop either, but will start at Lake Merritt and end at the 16th Street Station. Besides Oakland Urban Paths and the Oakland Heritage Alliance, the city of Oakland also does downtown walking tours. See a more complete list of Oakland walking tours on the OaklandWiki. After the walk, if you noticed a couple of people working the soil in front of the train station, they were doing prep work for the WOW Farm. It's part of an youth entrepreneur program with the Game Theory Academy, whose mission is "to improve the economic decision-making skills and provide opportunities to low-income youth who have experience with juvenile justice, foster care and homelessness." They'll be using some of the space in front of the train station to grow cut flowers. Saturday was the Oakland Vegan Beer and Food Festival, put on as a fundraiser for Rocket Dog Rescue. The gathering at Classic Cars West featured food from S+M Vegan and Hella Vegan Eats, and Commonwealth Cafe was serving up beer and cider. A ton of people and lots of dogs showed up for the event. The lines were incredibly long, but people were waiting patiently. I spent most of my time drinking a beer and taking pictures of dogs. There's a ton of stuff going on in Oakland, and lots of it focused on art. The weather is forecast to be warm and sunny, so get out and enjoy Oakland! Friday is a First Friday, which means it's time for Art Murmur. 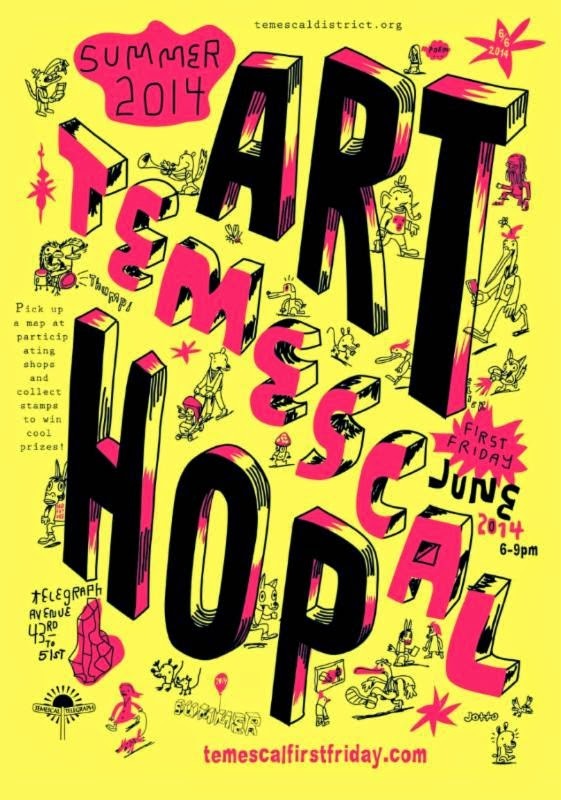 Art Murmur has spread all over Oakland, including Temescal, which is putting its own twist on it with the Temescal Art Hop. And what better way to start things off than dinner at my favorite food truck gathering, Bites off Broadway? There's also Jack's Night Market and Dancing Under the Stars at Jack London Square on Friday. There's an Opening Art Reception for "Disconnect" at Transmission Gallery. Saturday and Sunday are the annual East Bay Open Studios. It's a chance to explore art in and around Oakland, meet the artists in their studios, and enjoy our great city. If you love animals and beer, check out Pints for Paws benefitting the Berkeley-East Bay Humane Society. Underground Runway presents Hardcopy, an art and fashion event at Warehouse 416. And there's a vegan food and beer fest at Classic Cars West. Attitudinal Healing's 16th Annual ArtEsteem Exhibition, "Reflections of Me and My World", at American Steel Studios. Further ahead, Waterfront Flicks at JLS are starting up again, and there's an Oakland Urban Paths walk 6/14. Don't see anything you like? Check out one of Oakland's awesome parks, stroll around Lake Merritt, or explore a new neighborhood in Oakland!